there was still a little bit of snow on the ground. to bud out, and the colors are not so intense. 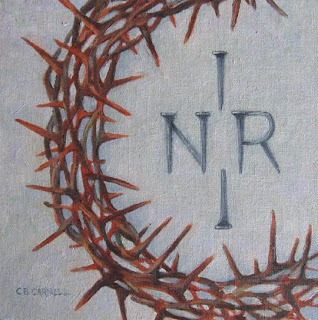 please feel free to visit my website. Thank you. 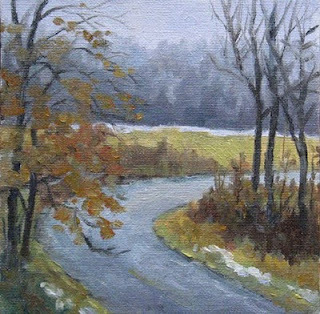 1800-1880' by Merri Lou Schaumann. the auction, the sponsors, the artists and the exhibit. My thanks to my sponsors, Dave and Ginny Rahal, and to Linda Witmer, Executive Director of CCHS and whose book 'Changing Images, The Art & Artists of the Carlsile Indian Industrial School' gave me much inspiration. which was founded in 1879 By Richard Henry Pratt. I wanted my design to incorporate elements of the Indian children, their artwork, their journey to the school from their native lands, and their transformation while at the school. Some came to the school, and because of illness never left the school. Others, like the amazing athlete Jim Thorpe, went on to achieve world-wide fame. Their story is fascinating, and to learn more you can go to the Cumberland County Historical Society's Web Site. 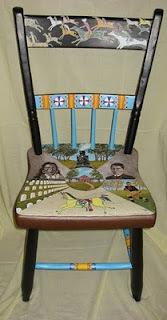 Below is a picture of my finished chair. Most of the Indian children were transported to the Carlisle Indian Industrial School by train. The images of the young Indian on the top left shows the young man in ceremonial dress, and then on the top right he appears in 'civilized' clothing. These two elements of the chair represent the transformation of the Indian child once they were integrated into the school environment, and were based on the famous photographs of Tom Torlino, Navaho. 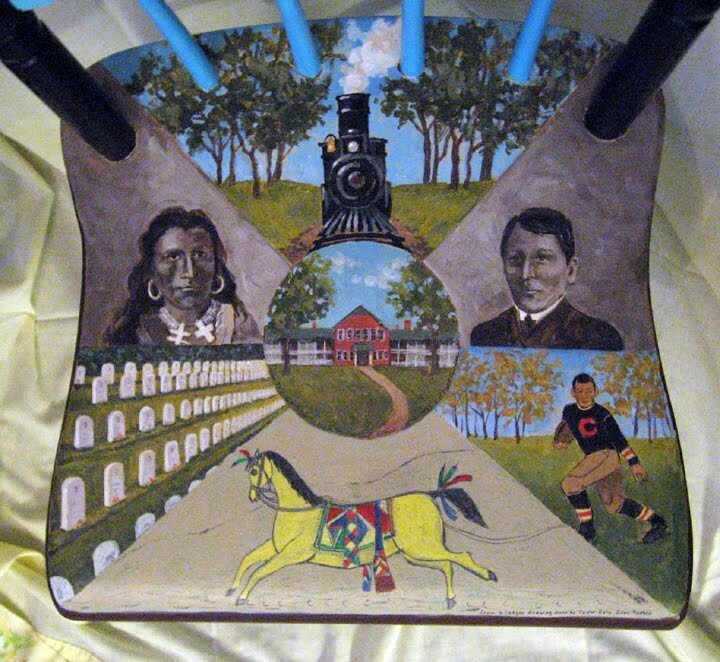 The hub of the seat is a picture of one of the buildings on the campus of the Carlisle Indian Industrial School. If my research has served me correctly, it is the Instruction Building. The image on lower left of the seat is of the Carlisle Indian Industrial School graveyard, where many students were buried. Sadness comes from viewing the headstones marked 'Unknown', and one has to wonder who these children were, and who were there ancestors. The image on the lower right is of Jim Thorpe, one of the most notable students of the Indian School, and who was named All-American while attending the school. 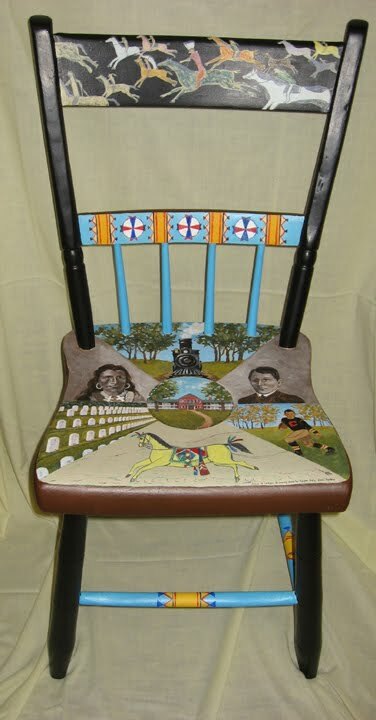 The Image in the lower bottom of the seat is a reproduction of one of my favorite ledger drawings done by Taylor Ealey, a Zuni Pueblo student. I was so attracted to the bright yellow color of the horse, his prancing pose and visible hoof prints, and his beautiful ceremonial blanket and adornments. This is a detail of the top front splat of the chair, and reproduces a drawing done by Alvin Good Boy, Sioux. This was probably the most challenging aspect of the chair because I wanted to be true to his original design, and attempted to recreate in paints the look and feel of a colored pencil drawing. 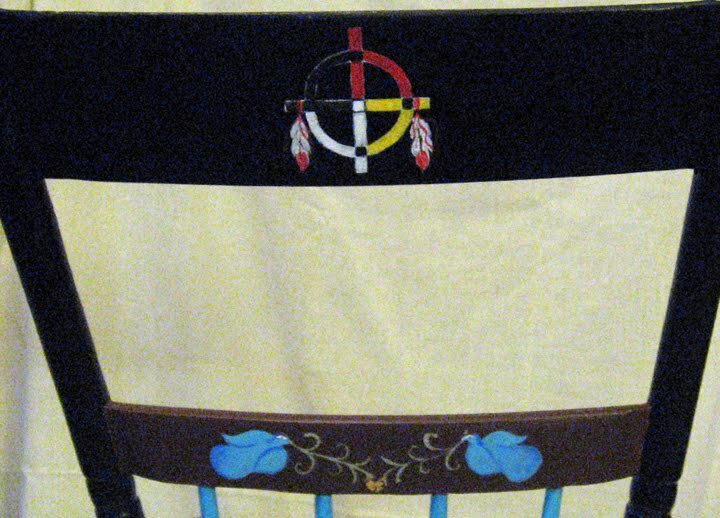 Below is a detail of the middle front splat of the chair, and reproduces a typical pattern used by the Lakota Sioux for creating a beaded belt. The yellow bands of this pattern are also repeated on the bottom rungs of the chair. a design often used by the Indian children in their ledger drawings. exhibit, a picture immediately came into my mind. crucifixion nails for 'INRI' in a cross shaped format. really enjoyed working on it. 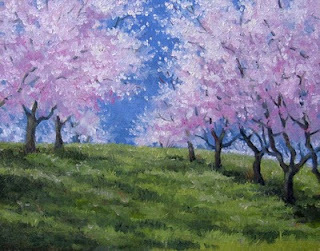 to recreating the airy, light quality of the blossoms. visit my website. Thank you. I felt like there was nothing left in me to give. And I remembered to thank God again for this gift. 'would just be perfect for you to paint, Grandma'. 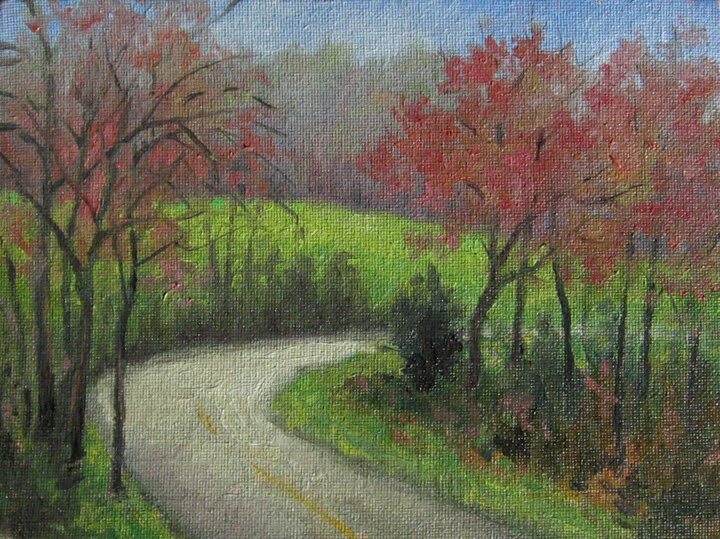 opportunity to pull it into one of my paintings. 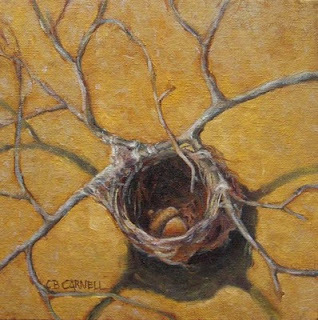 tiny nest - it's opening is only 2" at the widest part. to lay it's 'egg' in the nest this time! please check out my website. Thank you.